Less than three months after Golden Nugget Casino initially extended the hours for its Live Dealer games, the industry leading NJ online casino is at it again. This time around, the hours of operation have been lengthened to a full twelve hours a day, suggesting that player demand for Golden Nugget’s exclusive format is indeed exceeding supply. Previously, Live Dealer tables were open for business between the hours of 5 p.m. – 2 a.m. Sunday through Thursday. Saturdays and Sundays featured slightly longer hours (4 p.m. – 3 a.m.), presumably to combat the heavier weekend traffic. Going forward, Live Dealer games will run from 3 p.m. – 3 a.m. seven days per week. These extended hours also apply to the Live Dealer Blackjack 3 table, which up until now, ran at slightly different times than the site’s other four live streamed games. Worth noting, is that Golden Nugget VIPs are now permitted to bet up to $1,000 per hand at the Live Dealer Baccarat table. The rest of us common folk are only permitted to wager a maximum of $500. Based on the looks of the Live Dealer lobby, the site’s blackjack games were experiencing heavy foot traffic. Live Dealer Blackjack 1 is even listed in the final eight of the site’s March: Games Madness promotion, which allows players to earn Golden Point multipliers on the site’s biggest games. 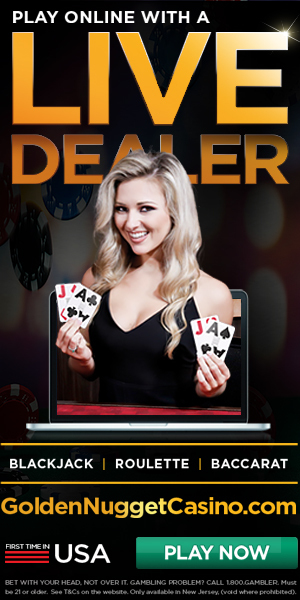 The overwhelming success of Live Dealer is noteworthy for a few reasons. Primarily, it’s introducing brick & mortar casino players to the online gambling world without asking them to jump feet first. Also, it’s lending credence to the notion that Live Dealer games will one day become an integral facet of the NJ online casino industry, eventually featuring multiple sites that support the format. Granted, Live Dealer Games are probably not the sole reason why Golden Nugget AC revenue eclipsed the $5 million barrier in February, but they’re not exactly working against the industry leader either. In other news, Golden Nugget has made a significant upgrade to its interface. Going forward, players will gain access to a special bonus tab. In addition, there is a field by which players can enter a promo code and view the details of a promotion. They can then choose to forgo to claim the bonus. What’s particularly nice about the new bonus tab is that players won’t miss out on any offers, as all eligible promotions are clearly listed with a large icon. That’s good news for value hunters, who will be better able to stretch their gambling dollar when a promotional event is active. A longtime poker player, Robert DellaFave has written for various publications covering the regulated online casino and online poker markets in Pennsylvania and New Jersey. These include OnlinePokerReport.com, PlayNJ.com, PlayPennsylvania.com, and PokerScout.com. What’s The Best Live Dealer Side Bet Available On Golden Nugget Casino NJ? What Live Dealer Games Should Golden Nugget Casino Roll Out Next? Live Dealer Or Digital? Which Golden Nugget Casino Games Are Best Suited For Me?